Wilbur and Orville Wright working on the first powered heavier-than-air flying machine. The first flight by a powered airplane at Kitty Hawk on the North Carolina coast. Orville Wright is at the controls while his brother Wilbur, on the ground, tries to hold one wing to prevent the aircraft wobbling. 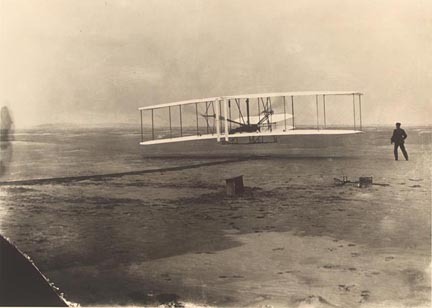 The beginning of the first flight, December 17, 1903. This is the complete print of the photo taken by John Daniels. The chip in the lower left corner is often cropped out. Credit: U.S. Library of Congress. Orvillle (1871–1948) and Wilbur (1867–1912) Wright were American aeronautical engineers who built the first successful heavier-than-air aircraft, flown first from Kitty Hawk, North Carolina, on December 17, 1903. Three years earlier, Wilbur and Orville had been camping out day and night in the lonely Kill Devil sand hills, four miles south of Kitty Hawk. They worked long hours by day, flying and observing a large kite-like object. Only the postmaster knew what they were doing: testing their first glider, the forerunner of the powered airplane. From a hilltop they launched their machine into the air. Those few people who looked closely saw that this was no ordinary kite. For one of the brothers was manipulating it with four control cords. These were their own invention. The cords allowed them to adjust the surface angles of the machine so that the glider kept its balance even in squalls which would normally have tossed a kite every which way. There had been other machines like theirs. But, unlike other inventors, Wilbur and Orville Wright were to progress until they invented the first airplane. 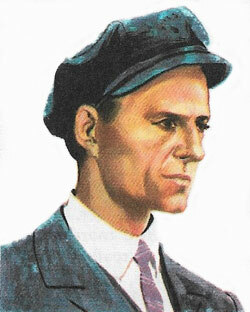 Wilbur, the elder brother, was born in Millville, Indiana, in 1867. Their father was editor of a Protestant church magazine, and later became bishop of the Church of the United Brethren of Christ. He moved to Dayton in the course of his work, and there, four years after Wilbur, Orville was born. It is said that the boys' father first aroused their interest in flying by giving them a "bat" – a toy like a small helicopter, built of sticks and paper and able to make short vertical flights. Perhaps this made them wonder for the first time if it would be possible to make a machine which would carry a person through the air. When, like the other children in their town, they flew their kites, the same thought must have come back to them. This was the era of the first motor cars. People were very excited about these new horseless carriages. Wilbur suggested that they should enter the car business and corner the market. Orville replied that it would be just as easy to invent a flying machine. This idea had obviously taken root and it was not long before they got to work on it. Though Wilbur and orville were not rich, they were lively and independent and thought for themselves. Wilbur later paid tribute to the way their parents encouraged them "to follow their interests and to investigate whatever aroused their curiosity." One of the enterprising things they did when they were young was to produce their own newspaper. Wilbur had given orville a small printing set for his birthday. Orville made a larger and faster printing press and then got Wilbur to be editor of the newspaper. They called it The Midget. The first number had 17 advertisements and was three pages long. The next edition was banned by their father, who had learned that his boys intended to make fun of their former school-teachers. This was not only the age of the first cars; bicycles were also becoming quite common. The brothers' enthusiasm for anything mechanical resulted in their setting up a cycle repair shop. They even made bicycles themselves which were improvements, they said, on other models. They accumulated just enough capital to start on the project that had been in their minds for so long: the construction of a flying machine. In October 1900, the Wright brothers were fighting the mosquitoes and cold among the dunes at Kitty Hawk. They chose this spot because Washington Weather Bureau tables showed it to have steady 20 mph winds. In fact, its winds varied greatly and occasionally reached 60 mph. Gliding experiments were known to be dangerous. Otto Lilienthal, the pioneer in so much of this work, was eventually killed by one of his gliders. Lilienthal's machine was balanced by the pilot's weight. He had to shift from side to side to control it. 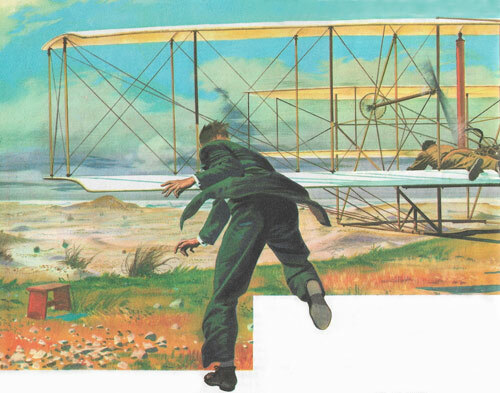 He could not, as the Wright brothers eventually did, use wing flaps to raise or lower one wing and so level the glider. 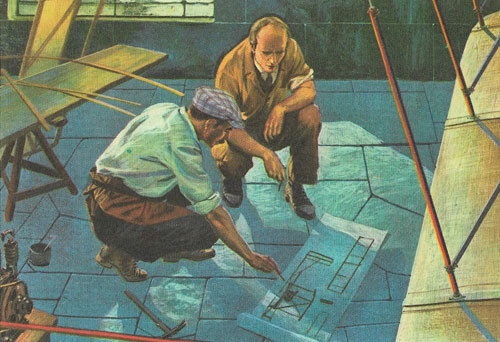 The Wrights were also perfecting a device called an "elevator." This as a horizontal rudder on the front of the glider which very effectively lowered or raised the nose of the machine and could prevent it from making sudden dangerous dives or climbs. At first, the brothers flew their glider from the ground like a kite, but within a week they were taking turns lying on the lower wing. In the following year, 1901, flights of up to 389 feet were made in an improved version of their first glider. The brothers had been relying on existing facts on aeronautics. These they found to be, without exception, unreliable. They got very depressed more than once. "Not in a thousand years," wrote Wilbur, "will man be capable of sustained free flight." Back at the bicycle shop in Dayton, however, the experiments continued. They set up a wind tunnel and, in the winter of 1901, used it to test many different models of wings and gliders. In 1902 they made more than 1,000 glides, the longest being over 600 feet. They now had a glider that really worked. Would they be able to make a powered flying machine? They tackled this problem without delay. To build a machine that would fly under its own power, they needed propellers, and machines to turn the propellers. Steam engines were obviously hopeless as they were much too heavy. At that time there were 12 manufacturers in the United States of the newly invented combustion engine, but none of these engines was light enough either. So, in October 202, the Wrights designed their own engine. It weighed 152 pounds and could develop 12 horsepower, which was four more than they reckoned they would need. Next, the propeller. Here again they were on their own, as no one knew how to make an airplane propeller. Eventually the Wrights designed one that was one-third more efficient than the best so far suggested, but which, they realized, was far from ideal. But they were keen to be airborne, and refused to waste another summer perfecting a propeller. When they discovered that the propeller rolled the machine in the direction opposite to that in which it was rotating, they promptly put on two propellers, turning in opposite directions. These tended to cancel each other out, and thus the aircraft flew level. For the first time, too, they laid rails for the take-off. On December 14, 1903, the Wrights hung out a small flag over the shed in which their flying machine was housed. This was the signal that they were ready to fly their machine. They wanted witnesses because they realized how important the occasion might prove to be. Everybody helped push the machine up the hill. They spun a coin. Wilbur won the right to pilot the first flight. He lay on the lower wong. On his right was the throttle, on his left the elevator control. The wing flaps were controlled by cords tied to his body. The machine was tethered to a post Orville set the propellers going. When Wilbur released the tether spring, the airplane shot forward down the rail and took off before they were ready. Orville, who was meant to be holding one wing to stabilize the aircraft, was left behind after a few yards. The machine climbed upward far too steeply, stalled, and crashed into the sand, causing damage to the structure. Wilbur admitted that the crash was due to his error in turning the elevator up too much. Actually, this trial would not have counted as a true "first flight", as the take-off was downhill and assisted by gravity. The slight crash damage was soon repaired, and three days later, on December 17, conditions were again suitable. It was now Orville's turn to pilot. This time the take-off was smooth. Wilbur managed to hold on to the wing until he felt sure the machine was airborne. It stayed up for 12 seconds and covered 40 yards. They held three more tests that day. On the last Wilbur flew 284 yards and was in the air for a minute. The five people watching on that windy day in 1903 had seen the birth of the airplane. People did not scoff at the Wright brothers. They simply ignored or remained unaware of the remarkable new invention. An irresponsible journalist wrote such an exaggerated account of the flight that more papers refused to publish it. The Wrights tried to interest others in their work, but they had to wait several years for this. France responded first, and Wi;bur, on a European tour in 1908-1909, was wildly fêted. Home recognition came at last when on July 27 and 30, 1909, at Fort Myer, Virginia, the airplane was demonstrated and the United States Government was forced to acknowledge that this was a machine "of vital importance in transport and warfare of the future." At long last their years of hard work and methodical application were rewarded. The Wright brothers patented all their inventions and their factory became famous all over the world.